Tasting panels: do you have what it takes? Most people expect their favourite whiskies to deliver the same flavour in every bottle they purchase. While the expertise of the master blender is imperative to the spirit’s flavour and consistency, a whole team of tasters are employed to deliver optimum results. Ian Wisniewski explores the requirements of enrolling on a tasting panel. There are myriad contributors that make a Scotch whisky taste as it does. However, so diverse and complex is the spirit that even using the same type of cask cannot guarantee identical results. Ensuring your favourite whisky tastes the same in every bottle ultimately falls upon the master blender, aided by the skills of an expert tasting panel to turn cask samples into a consistent product. It is, of course, an enormous responsibility. Achieving this consistency is all about choosing certain casks, which when blended together will produce the right result. A panel’s job is to taste new make spirit and mature whiskies, and help confirm that everything is as it should be. But who is eligible to join a tasting panel? Nearly everyone within a particular company, you may be surprised to hear. From the accounts and legal departments, to customer service or technical sectors, joining the sensory panel is an additional, part-time position. Of course, to get the most out of panel members, candidates have to meet certain criteria. The first hurdle is establishing each individual’s motivation. Enthusiasm and a real interest in the field is a must for Brian Kinsman, master blender, William Grant & Sons. Once applicants have proven their passion for nosing and tasting spirits, the assessment progresses to a more technical level. With William Grant, this next stage involves a sensory test comprising 16 different aromas, which must be identified blind. ‘Once you’ve passed that test it’s repeated, but this time the samples are diluted tenfold to see how you score when the aromas are at a much lower concentration, which is significantly harder,’ explains Kinsman. And then, if your nose passes the test, congratulations: it’s time to get to work. Further training is provided for successful panel applicants, including a general overview of the whisky production process and an explanation of the format of each sensory test. ‘The majority of the work is nosing, and this can be split broadly into three types of tests,’ says Campbell. ‘“Difference testing” is looking at whether the panellists can detect a difference between two samples, and we use the tetrad test where panellists are asked to separate four glasses into pairs. As previously mentioned, being a member of a tasting panel is an additional line of work carried out alongside a full-time occupation. So, how does a typical day in the life of a tasting panellist look? Control samples are made available in case any anomalies or queries arise. A computerised record of panellists’ results is collated by panel leaders, with measures put in place to minimise and eliminate any potential risk of biased results. Other projects may be works in progress and, as such, details are kept tightly under wraps – even from panellists. Similarly, there is a specific remit for the panel at Glen Grant, which currently has one tasting panel for single malts made up of the master blender and other production staff. However, that is about to change. ‘As tasting notes play such an important role in helping to communicate a whisky’s character to the consumer, I’m developing a second tasting panel which will be up and running by the end of the summer,’ says Robin Coupar, global brand ambassador for Glen Grant, which is owned by Gruppo Campari. Two panels may sound excessive, but while the quality of the panel’s work is of course paramount, the quantity of panellists can also be significant. Again, this considerably reduces the potential for bias and error of judgement – both of which work against producing a consistent, high-quality spirit. Sensory tasting panels operate under controlled conditions and adhere to particular practicalities in much the same way that any serious scientific experiment would do. On top of all the statistical and technical aspects involved, there are also strict conditions for entering the tasting room. ‘The tasting panel works in a lab-style environment that must be free of any additional aromas, which means no aftershave or perfume for the panellists,’ says Kinsman. So, you’ve established a knack for nosing and tasting, passed the tests and are willing to leave your favourite fragrance at the door. You’re eligible to join the panel, but how can you continue to hone your skills? ‘Once you’ve established that you can do it, it’s just practice to keep improving; that’s the single biggest thing if you’re nosing every day. Experience takes natural talent further,’ says Kinsman. But it’s also about furthering your use of language to describe aromas and flavours – a topic explored by Dave Broom last month in a two-part feature series: Decoding the language of whisky tasting and Articulating whisky aromas. Participating in a whisky panel can carry exciting prospects within the industry, and panellists could in theory work their way up to a full-time tasting panel at Edrington’s Glasgow-based Liquid Quality Team, says Campbell. Members usually have a scientific background, but this isn’t a requirement. And, from there, who knows? It could provide a route to the very top of the tasting food (or in this case spirits) chain. However: ‘Not everyone on the panel is trying to become the next master blender,’ says Kinsman – though it’s never a bad thing to set your sights high. ‘It’s more that they have a great interest in whisky, and continue working perhaps in the legal or the financial department,’ he adds. For anyone who does have an ambition to work their way up the whisky ladder, preparing to be a master blender takes time – typically at least 10 years’ experience or more, with the latter years spent working closely with the current master blender. But let’s not walk before we can run. For now, having found out what being on a tasting panel entails, and with at least some idea of how to get there, it’s over to you to take the first step and submit that application. Good luck! Macallan and Highland Park owner saw earnings reduced by global political and economic volatility. 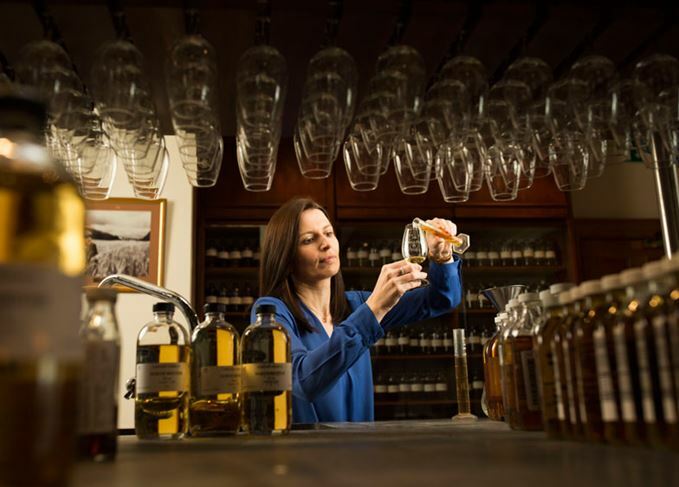 Glenfiddich’s malt master on chemistry, SPPM and being a world bagpiping champion. Richard Blanchard will represent single malt Glenfiddich in Australia and New Zealand.